Unitus Ventures has 10 questions for startups with a business idea that not only has the potential for success but also has a lasting impact on the world. Impact investing venture capital (VC) firm Unitus Ventures takes a slightly cautious approach to calling itself an “impact investor”. No, there’s nothing wrong with the term or its meaning, but it apparently creates a misimpression in people’s minds. Most people think impact capital is less about returns and more about creating a social impact, which is not really the case, says Srikrishna Ramamoorthy, who heads Unitus’ India operations. However, returns and impact are two sides of the same coin for Unitus. “We are about generating a market return and providing financial returns to the investor, but we focus on investments that create large-scale impact,” says Ramamoorthy. So, would Ramamoorthy still use the term “impact investor” to describe Unitus? Yes, but with a slight prefix. “We would like to call ourselves a finance-first impact investor,” he says. Founded in 2012, Unitus Ventures is a part of Capria Network, a global network of impact fund managers investing in the emerging markets of Africa, Asia, and Latin America. Unitus Ventures invests in early-stage startups and has invested in startups such as Milaap, Blowhorn, Awign, Cuemath, DriveU, and GoCoop. It is currently raising its second fund that has already received the backing from the likes of Bill Gates, Michael and Susan Dell Foundation, and Hemendra Kothari of DSP BlackRock (a mutual fund investment company), among others. Inc42 caught up with Srikrishna Ramamoorthy, who joined Unitus Ventures as Partner to set up the India office in 2012, to understand what really impact capital is and what kind of companies Unitus invests in. We also spoke to him about what he looks for in startups that pitch to him. If you’re a startup with a business idea that not only creates profit but is also designed to have a lasting impact in the world, then Unitus Ventures has 10 questions for you. Ramamoorthy, who says he is most productive between 5:30 am and 7 am in the morning, said Fintech is one of the key areas where the firm will be investing more in along with health care and education sectors which the company has already had a track record of focussing on. 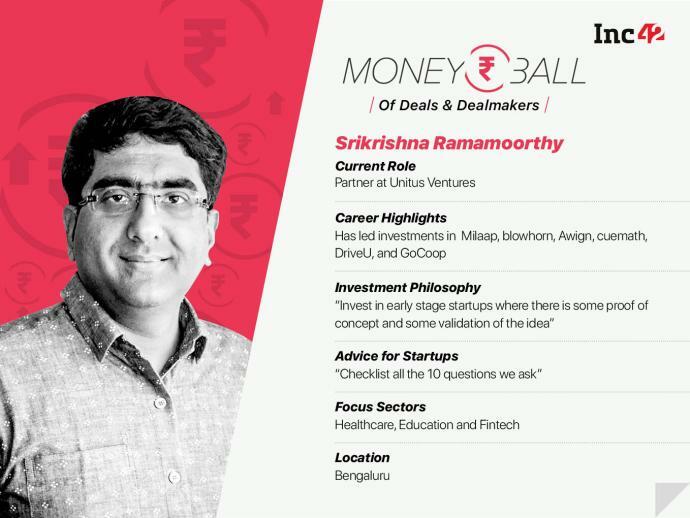 Here are excerpts of this week’s Moneyball with Srikrishna Ramamoorthy, Partner at Unitus Ventures, India. Inc42: What is your investment thesis? Srikrishna Ramamoorthy: We are an early-stage VC fund and we invest money where there is some proof of concept and some validation of the idea. The startups we invest in should ideally have some revenue, but we have done investments in startups that are pre-revenue as well. We focus on the seed and pre-series A stages. Our focus sectors are education, healthcare, and fintech, and our specialty is that we serve businesses that serve the masses. We believe there is a great opportunity among the people as we go down the socio-economic order where aspirations are rising, technology and mobile penetration are increasing, and we are seeing a large population base that is able to access more products. We typically invest anywhere between $300,000 (INR 2.2. Cr) to $500,000 (INR 3.7 Cr) and look to own about 20% of the company. Currently, we have 20 companies in our portfolio and we invest in between six-eight companies each year. Inc42: You have made quite some bets in education and healthcare and a few in fintech. How do you weight each sector? Srikrishna Ramamoorthy: When you look at our portfolio, we have been investing since 2014 and we are currently investing from our second fund. From the first fund (2013), a bulk of our portfolio went into education and healthcare and then, as we started to build our Fund II (early 2018), there were a lot of opportunities in fintech that we saw, which is why we are now focussing on fintech also. The entire mobile Internet penetration that is taking place in India along with Aadhar-based authentication has led to fintech becoming an exciting and large opportunity. Inc42: Education, especially reskilling, seems to be playing a driving role in your investment decisions. Is it on purpose? Srikrishna Ramamoorthy: Not so much reskilling, but we are looking at employability. One of the companies in our portfolio is Utter, which is a B2B/B2C English learning app that helps people pick up English fluency for workplace success. It can be for someone who is a front-end retail employee or someone who is working as a security guard at the bank. It’s a bottom-up approach. The end consumer is not paying for it, it’s the business that buys the subscriptions for their employees. Inc42: Could you take us through some of your latest investments? Srikrishna Ramamoorthy: One of our latest investments is in Awign, which is a platform that provides paid internships for students. For example if you are an oil company and you want to go and make a check at all the petrol pumps or if a consumer company wants to see if its products are sufficiently stocked in all the kirana stores in a particular region…it’s quite difficult to get a vendor and get all the checks done. So, what Awign does is it takes these kind of projects and gets a student workforce to execute it by breaking it up into a micro-task. This gives the students an income and, more importantly, it gives them a sense of having gone to the market and done something. We have invested in a medical devices company called Cyclops, which uses a wearable device that’s used to detect pupil movement (in the eyes) and to identify conditions like stroke and vertigo. There is an IP in the design and a great team. Inc42: Talking about the healthcare sector in India, what’s next here? Srikrishna Ramamoorthy: Affordability and access are dramatically improving in healthcare, thanks to a wide range of parameters, and we’re seeing this as an enabling factor for point-of-care devices and for tech-driven services. There’s increased private participation in public healthcare today wherein we see innovative and deep solutions. Inc42: You haven’t used the term impact investing in our conversation, why so? Srikrishna Ramamoorthy: Often, when people hear the word ‘impact investing’, there is a perception that it is not about the financial returns and it’s more about creating a social impact. That’s not what we are about. Generating market returns and providing financial returns to the investor is critical, but we also focus on investments which create large-scale impact. Inc42: Would you call yourself an impact investor then? Srikrishna Ramamoorthy: We are an impact investor…we would like to call ourselves a finance-first impact investor. Inc42: How do you assess technology when you are evaluating tech investments? Srikrishna Ramamoorthy: Our team comes with a very strong experience in building and scaling technology products/services across cloud, mobile, hardware systems, etc. We also have a strong network of experts who we rely on for diligence in other areas. As an example, our first evaluation step for any consumer business is for at least three of us on the team to try the product or service, evaluate user/customer experience, then understand how the backend systems work, after which we do a deeper dive into the technology for reliability, scalability, maintainability, etc. This deep dive will almost always include a detailed review of the architecture and design (product, user) of the system. Inc42: How do you see the employability outlook as whole in India? Increasingly, it is becoming critical to move away from the age-old model that the workforce should comprise only employees working full time and clocking a fixed number of hours. The traditional model worked in the era of mass production and consumption where the consumer had almost no choice. How do we bring about this culture in society? With 12Mn individuals expected to join the workforce every year, we are on the cusp of the fourth industrial revolution. On the flipside, they are not being adequately equipped for a rapidly changing job landscape. While, the world over, technology is threatening to eliminate jobs, the education system in India has not stepped up to face this challenge.